“Based on true events…” Words that will strike the fear of God in any film viewer, for you just know that the movie that will follow will be so sombre, so gloomy, so mind-numbingly depressing, that at the end of it you’ll either want to slit your throat or murder your cat. Such is the case with Gandhi My Father which takes on the formidable task of attempting to demystify the Mahatma by showing him as baap and not just baapu. For the most part it succeeds in doing that, but, sadly, at the cost of an engaging narrative. Harilal Gandhi (Akshaye Khanna), M.K. Gandhi(Darshan Jariwala)’s eldest son, an eager but awkward and under-achieving naïf, is consistently thwarted in his desire for personal gains by his father’s unflinching dedication to the cause of India’s struggle for independence. The two men are locked in a battle of wills for years, with Gandhi Jr. growing ever more estranged from his illustrious parent. As his mother Kasturba (Shefali Shah) watches helplessly from the sidelines, Harilal, haunted by his failures, descends into alcoholism and worse, until finally disappearing into obscurity altogether. One is aware that with a story like this one can hardly expect a laugh-fest, but even the most morose of films manage to inject some breathing space into the mix. Not so Gandhi My Father. Here, the sense of utter despair is so all-consuming that it never lets up; it is relentless, and annoyingly so. It doesn’t help that the film’s generous running time seems to last an eternity thanks to paint-peelingly slow pacing. Sure, many a great film has adopted a languid tone – think 2001: A Space Odyssey, or The Godfather. But unlike those films, the script of Gandhi My Father lacks a compelling dramatic arc, and this is reflected in a major structural flaw i.e. the film ends on the same note where it started, with a cycle of repetitive incidents strung together connecting the two ends, resulting in a narrative that never flows. The film fails to become a whole, reading instead like a series of scenes that are pinned together and boy, do those joins show! The prologue, where a bedraggled and dying Harilal is brought to a government hospital, is too short to have an impact and some scenes seem to exist merely to make ponderous ‘statements’ that have next to nothing to do with the film’s story. And that is another weakness in the script: it is often way too literary and preachy, coming off as smug in its own ‘cleverness’. As a cinematic character, Harilal is less Michael Corleone and more Fredo. If he were some kind of oppressed dark horse, you could perhaps root for him. But it’s hard to do that when it is plain to see that he is, for the lack of a more apt term, a screw-up, and a hopeless one at that. Either writer/director Khan failed to pencil in any redeeming qualities, other than a boyish smile, or the man simply did not have any. Either way, one is hard pressed to identify with a mediocrity who is only ever mildly interesting. In fact, even on celluloid, Harilal is swallowed up and blown off the screen by his father; maybe that is harsh, but there you are. 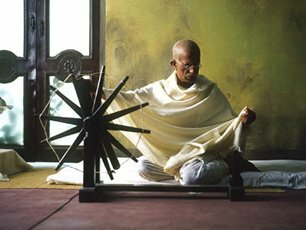 As played by Jariwala, the Mahatma is in some subtle ways, a more intriguing character here than he was in Richard Attenborough’s celebrated Gandhi (1982) – less saint-like and more humanized, with more than a hint towards his possible failings, or at least miscalculations, as a parent. 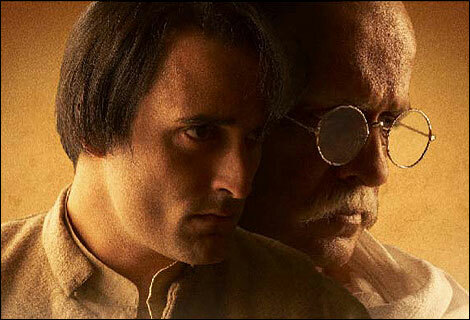 The notion that Gandhi could be father to a nation but not to his own son is a fascinating one, and the actor playing him manages to convey the nuances of that impossible situation. The script never requires more from Akshaye Khanna than to act the little boy lost, and he does that well enough, but it is still disheartening to see the talented actor being given so little to do. The same cannot be said about the wonderful Shefali Shah, who delivers a performance of quiet power as Kasturba, a character that is only slightly more fully written than the others but who becomes truly fleshed-out in Shah’s hands. The film does have its moments and there are some scenes that are genuinely moving, such as when Hari brings an orange for his mother and chants her name amidst a crowd of Gandhi bhakts, as well as the footage of post-Partition chaos. It is also a handsomely filmed work, with cinematographer David McDonald giving the visuals a warm, period feel. On the whole, however, stage veteran Feroz Khan’s debut feature as director is too much of a one-note downer to be memorable.